We want to do a second round of this, so this retraced version is also cut out (see below, left) and I draw a horizontal line which is the bust level, and work out the bust point position along this line. All of the darts converge on the bust point, and it is around this centre that they can me rotated and manipulated. I now slice the pattern to the bust point from the side seam; from the centre front line; and up from the waist-seam - all converging on the bust point. Finally I cut from the bust point up towards the shoulder but stop just short so it stays in on piece (see below, right). I can now pivot the four sectors to open up space and capacity around the bust. I don't want the shoulder to change, hence I have not cut through the edge again. 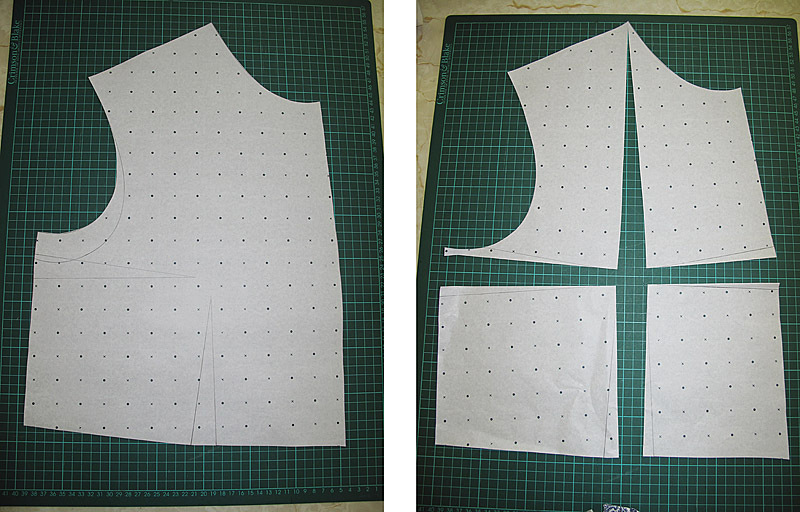 The opened out triangle leading from the shoulder will simply be skimmed over with fabric. 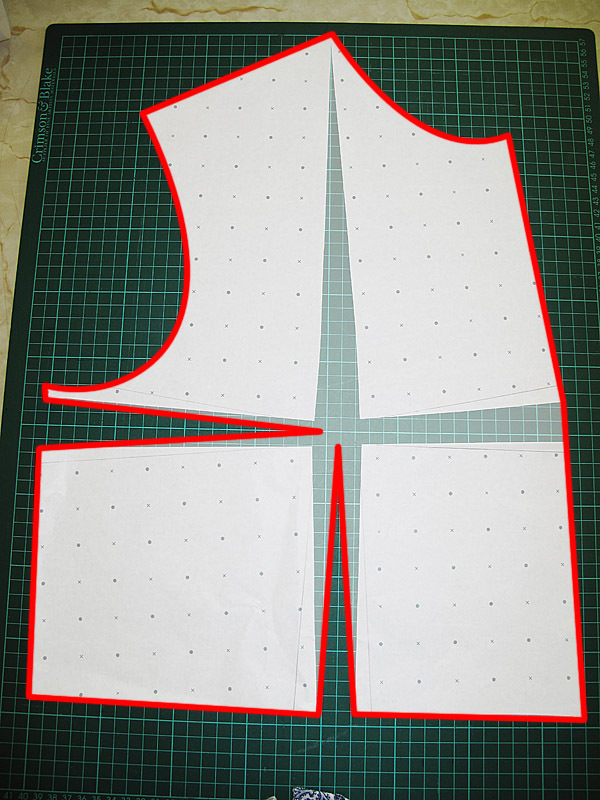 The side seam is open by about an inch, and this becomes a dart towards the bust point, with the same happens from the waist. The opening towards the centre front is also skimmed over, and the previously straight line of this edge is allowed to bend at the level of the bust point. 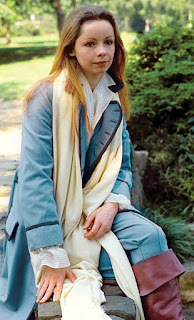 Phew - still with me? It all comes together in the next bit. This is glued to a further piece of paper to lock their positions, before being placed back under the block to trace it into where it belongs. You can see how the side seam is still vertical, but the front centre line is now skewed out at the bottom. All of this will come together once it is cut in fabric and sewn into position. To check out my pattern, I knock up a quick calico test at college and put it onto a suitably sized mannequin (see below). My tutor suggested that the front edge needed a little extra hitch up, so as a test we put an extra smaller dart on one side only. When it is worn we can then see if one or other side hangs better. Again at this stage I am not paying any attention to the double breasting as this will be added later. All I an interested in is the front edges butting up vertically, defining the centre front for me. 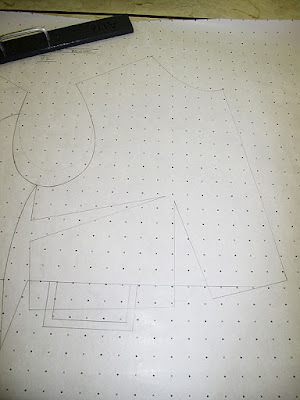 I think we are ready to try the pattern out in three dimensions by making a calico test. 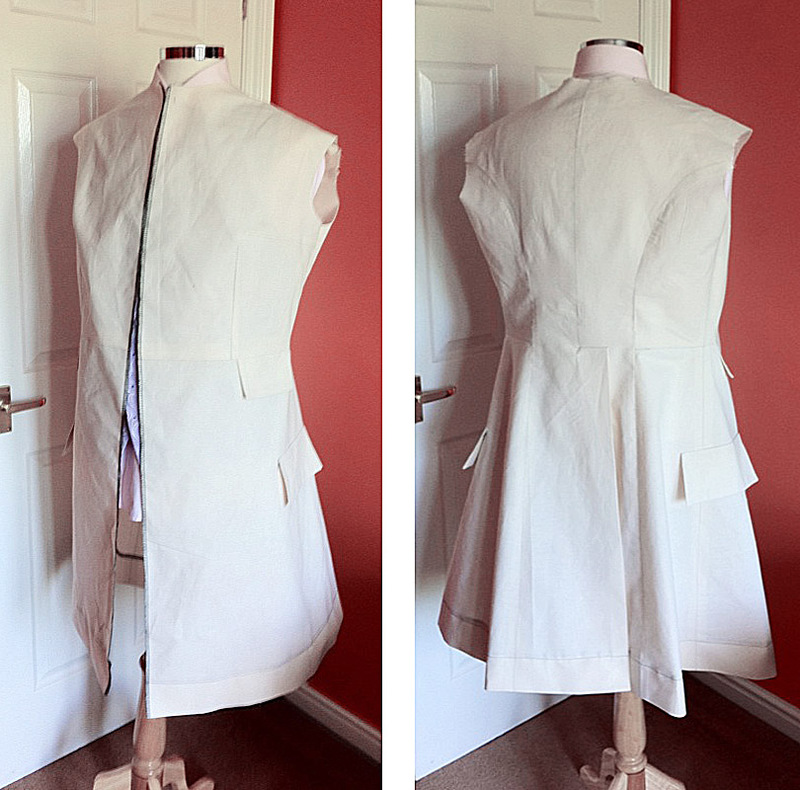 I quickly block the body together with the skirt section and some pocket flaps to demonstrate position and size. As you can see, on my mannequin the centre front seam is meeting nicely in the middle. Before sending it out for a first fitting I’ll add some basic sleeves so we can gauge the length needed, from there we can develop the pattern further and move towards a final design, at which point I will add the lapels and overlap. Check back to see how we got on.